Yes, I know, I know, Halloween is still a long way off, but you can never be too early in your preparation, can you? 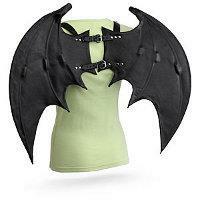 After all, how many people do you know will actually dress up while wearing Handmade Leather Wings with Harness? Only a select few, I believe, and to those who want to, you will need to fork out a rather handsome $199.99 in order to have this as part of your wardrobe. It certainly looks far cooler than the tried and tested fairy wings at your local costume superstore. You can be sure that these leather wings are going to be far more durable compared to the pastel and flimsy fairy wings that are made up of plenty of fibers not found in nature. These leather wings have been individually handmade by an artisan in Seattle, where they boast a flexible wire frame which runs down the “fingers,” allowing them to be shaped according to you look like the dragon or bat form as you wish. Built on a sturdy leather harness with five different buckles, make sure of your wingspan prior to walking through doorframes. I wonder if Batman ever had any such troubles.